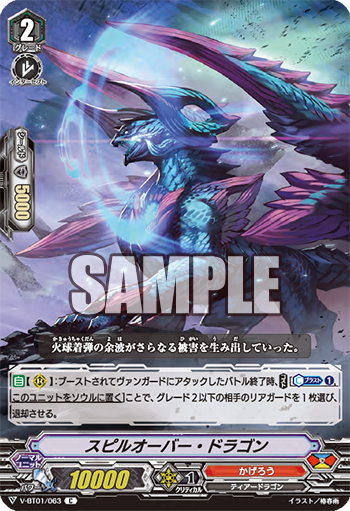 The Japanese card of the day for April 11th, 2018, is Spillover Dragon, a Kagerо̄ Common from V-Booster Set 01: UNITE! TEAM Q4! AUTO [Rearguard Circle]: At the end of the battle it attacks a vanguard while boosted, by paying [Counterblast 1, put this unit into your soul], choose 1 of your opponent's grade 2 or lower rearguards, and retire it. Spillover's skill is a one-for-one retire that makes it possible to strategically eliminate problem cards with recurring effects like Jarron, Marron, and Wingal, ideally paying itself off by decreasing the amount of shield you need to guard with throughout the match. Being limited to grade 2 and lower means it can't touch rearguard-focused grade 3s like Vortex, but these are comparatively rare. 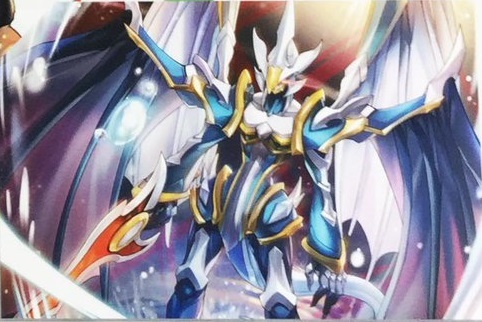 One aspect of the card to watch for is how it fills up the soul, similar to Kimnara and Gattling Claw of past formats; the aforementioned Gaias is a manga card has a soulblast cost in the preceding version of the Vanguard TCG, and it's possible the new manga-inspired deck will likewise utilize the soul so that Spillover can be both a control and setup card in one go. There are a number of other possibilities for the soul focus (fan-favorite Blazing Flare Dragon among them) but Gaias is the most immediate one considering the new series is "based" on the manga. For the immediate future, Spillover fuels Dragonic Overlord's +10000 power skill each turn to ensure he stays relevant well into the endgame. Spillover Dragon is illustrated by Tsubaki Harusame, known for illustrating the Big Bang Knuckle cards in the original game. The previous Japanese card of the day was the Knight of Rose, Morgana.